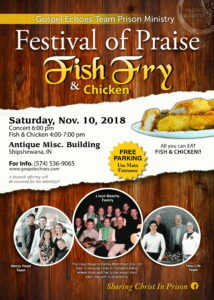 The Gospel Echoes Annual Festival of Praise, Fish Fry, and Gospel Concert will be held at the Antique Auction Building, Shipshewana, IN on Saturday, November 10, 2018. Fish and Chicken Fry serving starts at 4:30 PM, Concert 6:00 PM. All-You-Can-Eat Fish and Chicken Fry is by donation Special guests the Lloyd Beachy Family will be singing. From the countryside of Plain City, Ohio, The Lloyd Beachy Family is a family of ten whose music ministry has its roots in the early years of the childrens’ homeschool education. Mom would pull out her guitar and start the day with a morning sing-along. A number of years passed, and soon a few of the children began to add other instruments to the ensemble. As time progressed, their country/bluegrass instrumentation and family harmonies left their basement study hall and found its way into churches, prisons, community events, and nursing homes. Since they began singing together, their desire has been to use their talents to honor Christ and bring encouragement to their audiences. Gospel Echoes Mercy Road Team and New Life will be sharing their music as well.